This guide will step you through the process of enabling Cookies in Firefox. The menu button will be in the top right-hand corner of Firefox; it looks like three horizontal lines on top of each other. 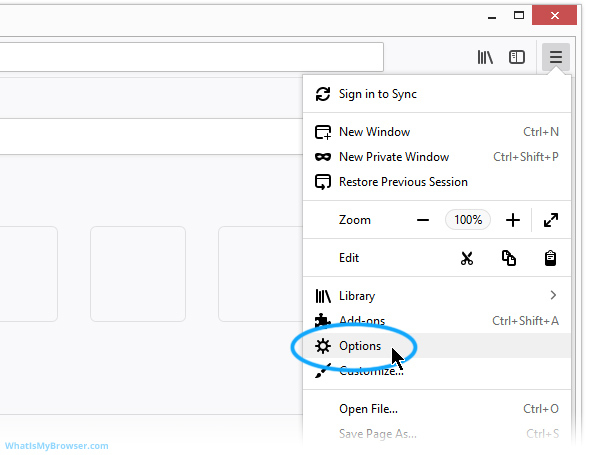 After you've clicked the menu button, the Firefox menu apears; one of the options in it is Options. Click it! The Options screen will now appear. The major sections are shown as menu items up the left of the Options window. Click the Privacy & Security item. You are then taken to the Privacy settings. Firefox groups the Cookies settings under the concept of "browser history". In order to change your browser's cookies policy, you have to configure the browser history settings as well. When you click on the "Firefox will:" drop-down menu, you will see three choices. Never remember history Alternatively, you can disable cookies altogether by selecting this option. Firefox will also not keep a list of the sites you have visited in your Browser History. Use custom settings for history will allow you more fine-grained control about what Firefox allows and remembers. You now have the choice of enabling or disabling certain history features, including form history, browser history and most relevant: whether or not to Accept cookies from websites. You also have some options regarding blocking third-party cookies if you want to configure that too. The custom options item also lets you configure how long Firefox will keep cookies for. Make your selection from the options available. Once you have configured your preferences, you can simply close this tab and continue using Firefox. Congratulations, you just configured Cookies in Firefox. Click here to check if Cookies are enabled. You may also want to take a moment to clear your cookies and history in Firefox.